These Three Terrific Recipes for Enchilada Soup have everything you love about enchiladas in a warm, inviting bowl of soup. You choose meatless, chicken, or green chile simmered together in the slow cooker or Instant Pot with terrific end results: Enchilada Soup your family will love! Click here to PIN Three Terrific Recipes for Enchilada Soup! For you Taco Tuesday menu idea for tomorrow we’re sharing Three Terrific Recipes for Enchilada Soup because tacos are great but there’s nothing better on a cold night than a hot bowl of soup. Each of these Enchilada Soup recipes contain different ingredients with flavors that are just like the enchiladas at your favorite Mexican restaurant. We’ve included three variations; one with beans and no meat, one with chicken, and one with green chiles and cream cheese. Choose the recipe that sounds good to you, grab your slow cooker or Instant Pot, (depending on the method of cooking you prefer) and make some delicious enchilada soup for dinner tonight! 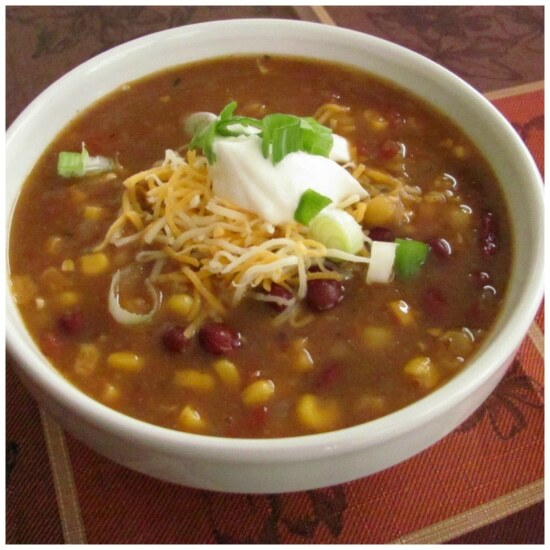 Slow Cooker Vegetarian Enchilada Soup from Louanne’s Kitchen has onions, chicken or veggie stock, tomatoes, green chile enchilada sauce, kidney beans, black beans, corn, and hominy, with just the right spices to add plenty of flavor. Add cheese, green onions, cheese, or even chips at the table for a perfect meal that cooks all day in the slow cooker while you are busy doing other things. 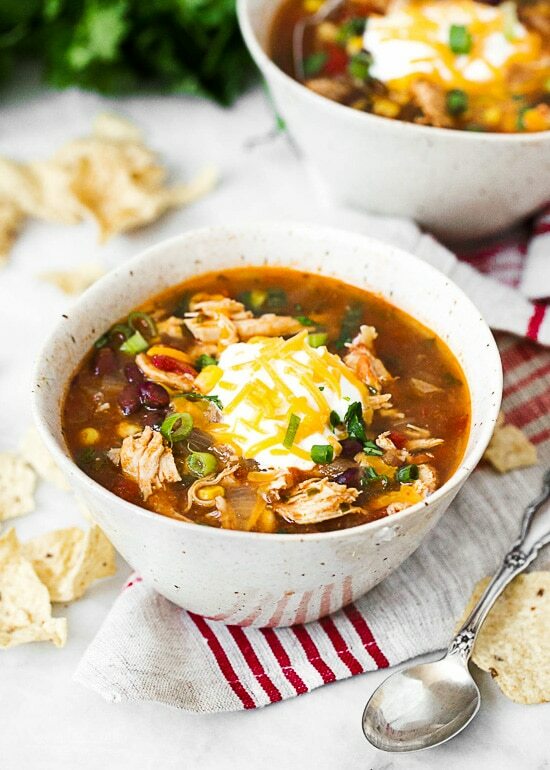 Gina says this Chicken Enchilada Soup (Slow Cooker and Instant Pot) from Skinnytaste is “an easy (maybe even lazy) way to make a dish that only dirties one pot!” With the combination of chicken, chipotle chili in adobo sauce, black beans, corn, and a few spices this sounds delicious and can be made in the slow cooker or Instant Pot depending on the cooking method you prefer. 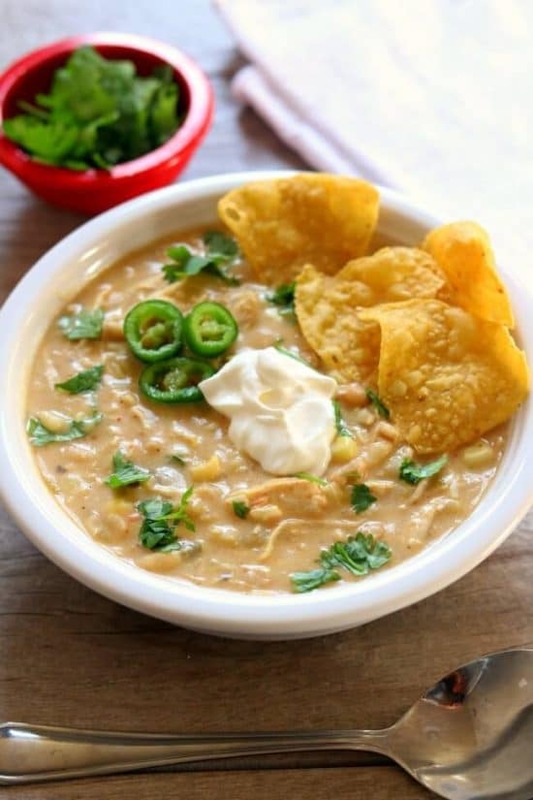 Instant Pot Green Chile Chicken Enchilada Soup from 365 Days of Slow Cooking is thick and creamy with an amazing flavor. Chicken cooks quickly in the Instant Pot so you can even start with frozen chicken breast if you forget to take them out of the freezer. Karen adds enchilada sauce, chunky salsa verde, green chiles, white beans, brown rice, and flavorful spices. At the end of the cooking time, cream cheese and sweet corn are stirred in for a delicious, hearty Enchilada Soup that will please your pickiest eaters. Use the Index Page for Soup or Stew to see all the slow cooker or pressure soup or stew recipes that have been featured on this site. This would be so good on a chilly Rhode Island night! I love making soup in the slow cooker; it fills the house with wonderful aromas all day long. Lydia, I know just what you mean! It is getting so cold around here – this would do the trick to warm our family up. Jeanette, I hope you guys finally have power. Not sure how you are staying warm without it!